Ngor Hiang is also known as 5 spices in Hokkien. Ground into powder, you get the 5-spice powder. However, the funny thing is that Ngor Hiang also refers to this dish â€“ which is essentially prawn and pork rolled in a soya skin. In Penang, they call it Lor Bak or Lobak whilst for us from Johor, we call it Heh Chor. There are many variants for the ingredients used but the main ingredients are prawns, pork and of course, the 5-spice powder. The 5 spice powder is popularly used for dishes like Chinese Stewed Duck and Kong Bak. This Ngor Hiang recipe makes about 13 rolls using 1 piece of soya skin (fuchok). The soft soya skin is used rather than the usual hard-type which is commonly used for other dishes like Ginkgo Barley Dessert. It is not an easy dish to prepare as it can be a bit labourious preparing the ingredients, rolling them up and finally, frying them. However, this tasty Ngor Hiang is bound to make you eat non-stop. 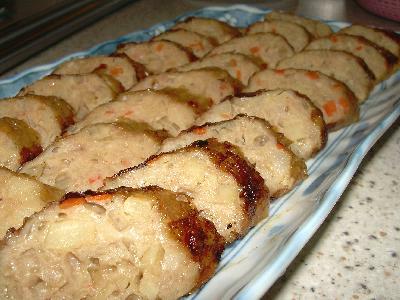 It is delicious on its own or a great accompaniment to steamed white rice. For added taste, give it a dip into chilli or tomato sauce. What I like most about noodles is the versatility of this staple food. You can cook fry noodles, stew them or even cook them in soup. Recently, I had with me a couple of slices of pork loin and some french beans and I thought this would be the perfect opportunity to try out something new again. Hence, Pork Chop Noodles was created. In Melaka, there is this famous Taiwanese Pork Chop Noodles but that is different from what I have cooked here. Whereas the Taiwanese Pork Chop Noodles uses soya noodles, I have used the dry noodles bought from Sitiawan instead. This dish is pretty due to the use of french beans and carrots for the contrast in colour. It is also healthy as it contains carbohydrate, protein, fat and fibre. 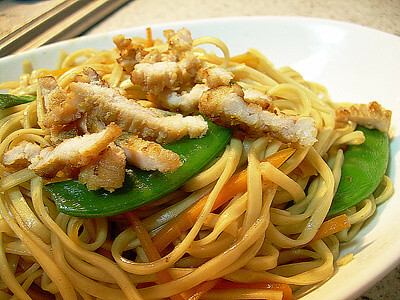 The french beans and carrots lend a crunchy bite to the otherwise springy noodles whilst the aromatic pork chop (which is cut into strips) becomes the highlight as far as the taste is concerned. Give this dish a try. You can use all kinds of noodles really. I would suggest soya noodles, instant dried noodles (eg. Vit Mee) and even soba for this dish. I was cooking Long Bean Rice over the weekend when I had excessive belly pork (or is it pork belly?) to use. So, I fooled around by experimenting with it to see if I could churn out a simple snack with it. Tastes not too bad and my daughter loved it to bits (pun intended). 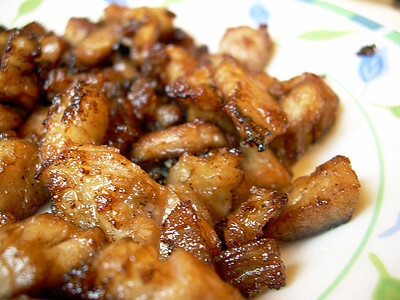 What I did was to chop the belly pork into really small pieces and marinade them primarily with worcestershire sauce. Then, I fried them till golden brown. My next quest is to find a way to tenderise the pork. Any suggestions? Frankly, I don’t know what kind of seaweed is this that I cook. 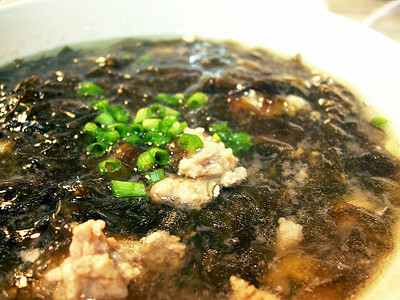 Since young, I have always known it as “Chi Chai” meaning “seaweed” in Hokkien. It is something sold in grocers in Malaysia and usually imported from China. The seaweed is nicely dried up to a round shape which you can cut to your preferred amount prior to cooking. Mum used to cook this every now and then as it is such a simple soup to cook, not to mention the mineral-packed properties of the seaweed. Don’t quote me but I heard that it is supposed to be good for those who are deficient in iodine. Anyway, this soup can be cooked in about 15 minutes time. Most of the preparation goes towards mincing the pork with a cleaver but if you buy the pork ready minced, you only need to take a shorter period to cook this soup.